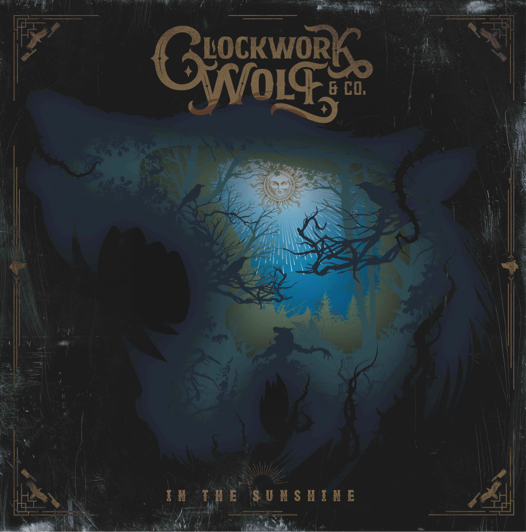 Clockwork Wolf & Co. are set to release their debut EP “In the Sunshine” in December 2018. The brainchild of vocalist/guitarist Rob Chapman, Clockwork Wolf & Co. is an Americana-inspired band playing ‘dusty road’ blues rock as it should be played – raw, direct and infused with energy. In the Sunshine is the perfect showcase for Clockwork Wolf & Co’s hard blues rock. From the heavy groove of single “In The Sunshine”, through to the staccato riffing of “Part Of The Plan”, and from the emotive lead guitar of “Old For New” to the beautiful orchestral melody of “Idle Hands”. The EP was recorded at Brighton Electric Studios throughout early 2018 and produced by Mark Roberts. The band lineup is completed by Zach Comtois (guitar / Britney Spears live guitarist), Jack Hosgood (bass), and Chris Hardwick (drums). Clockwork Wolf and Co. will tour in 2019. Details to follow. Rob Chapman may be a name familiar to anyone with an interest in the guitar. Rob is a pioneer of YouTube guitar reviews, and his YouTube channel (www.youtube.com/robchappers) has accumulated 680,000 subscribers. His channel receives more than 2 million views per month, totalling over 250 million views since Rob began creating videos. Rob has shared a stage with luminaries such as Joe Satriani, Steve Vai, and Guthrie Govan; was voted ‘Guitar Personality of the Year’ in 2015 and 2016 by Total Guitar magazine, and has featured in Forbes magazine as a successful YouTube entrepreneur. Rob also fronts the iTunes rock chart-topping act Dorje and runs the fastest growing and largest UK guitar company – Chapman guitars (www.chapmanguitars.co.uk).